« OPENhulu: setting Hulu's videos free? The Internet is not just a place to get the latest scores and follow your favorite team in the standings. The Web has evolved so well that it has displaced traditional media as the first-stop source for all your major-sports needs. Except for local coverage, there’s no need to watch TV sportscasts anymore. Pardon the sports pun, but the Internet has all the bases covered — from providing the usual scores, standings, and statistics to rich, always-available highlights, interviews, streaming games, downloadable games, podcasts, extensive season and historical archives, and a host of mobile solutions from wallpapers and ringtones to live GameCasts with Audio. Best of all, there are no timetables. The Big 4 professional sports leagues in the U.S. — the NFL, MLB, NBA, and NHL — have leveraged existing footage (usually developed through their “official” networks) to create their own unique content. The leagues flood their Web sites with an overwhelming array of branded digital content so fans can stream games, download ones they missed, and watch clips packaged in so many ways the head spins. We at last100, being the sports fans we are, decided to take a look at the Big 4 — plus the top “amateur” league in the U.S., the NCAA — to see where their Internet and new media strategies have evolved. Without a doubt, the major sports leagues are using the Internet so thoroughly to feed information-hungry fans that, except for the beat guys covering the local teams for television, radio, and newspapers, there’s little reason to watch nightly sportscasts or read the morning sports section. Having covered sports for major U.S. metropolitan newspapers for more than a decade, I’ve always believed that the beat reporters provide the best coverage. If they’re good, they’re always watching practice, conducting interviews, talking to sources, seeing what’s going on. But now I am not so sure. In an era of hyper connectivity, user created content such as blogs, fan participation (ESPN wants citizen correspondents for college games) and the speed of the Internet, television, radio, and newspapers cannot touch the breadth, depth and range of insight that’s available on the Web from the major sports leagues. The National Football League and Major League baseball — the two biggest and most lucrative sports leagues — are heavily invested in the Web but are taking slightly different paths. 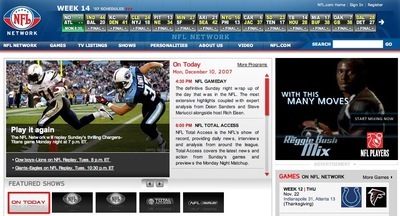 The NFL channels all of its content through its NFL Network in addition to NFL.com. The NFL Network shows additional games not seen on the networks — the recent matchup between the Dallas Cowboys and Green Bay Packers comes to mind. Update: In the original version of this post we wrongly said that the NFL Network is only available through DirectTV, when it is in fact available on a number of local cable networks. DitectTV subscribers can pay an additional $99 per year for the “Super Fan” package, which allows fans to stream NFL Network games to their computers. In a controversial move, the NFL made a move designed to protect the Internet operations of its 32 teams by telling news organizations that they are not permitted to carry unlimited video clips of players, coaches, or league officials online. They can only post to their Web sites video clips no longer than 45 seconds of footage shot at a team’s facilities, including news conferences, practice, and interviews. This move basically forces fans away from local television or newspaper Web sites to the NFL.com video galleries, which is accessible to more people than DirecTV. The league’s Web site is stuffed full of more content than even the most rabid of fans can consume. There are featured videos of the week’s games, video picks of the day, can’t-miss plays, rookie of the week, and so on. The branding is so extensive it becomes difficult to remember which is which. There’s NFL GameDay, NFL Replay, Playbook, the NFL Top Ten, the Point After. You get the picture. Not only does the NFL showcase a week’s games, but fans can watch highlights from the first preseason game, through each week, into the playoffs, and finishing with the Super Bowl. That’s in-season. Out of season there’s coverage of training camps and the draft. There’s even current and historical content produced by the legendary NFL Films. Whereas the NFL has created its own network through satellite TV and uses the Internet in tandem with it, Major League Baseball has set up its Web site for everything, including the network MLB.TV. Through MLB.TV, fans will find both basic and premium pay-for services, allowing them to watch complete games on their computers after downloading the league’s slick video player know as Mosaic. Mosaic is more ambitious than any other league’s Flash-based video players. Mosaic is designed to allow baseball fans to have a more interactive viewing experience, from changing viewing angles to providing integrated live stats alongside the game they’re watching. Through MLB.TV fans who don’t subscribe to baseball’s “network” can also view a wide array of ad-supported content from the Baseball Channel, view game video highlights, watch a features and lifestyle baseball “entertainment” channel, and download missed games at $1.99 each (multimedia center). 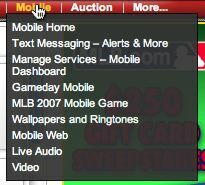 MLB also makes content available for sale via Apple’s iTunes store. The NBA differs from the NFL and MLB is that its content is spread more virally around the Web using outlets such as YouTube. The NBA and NHL are the only leagues that have their own YouTube channels. The NBA’s boasts more than 25,000 subscribers and nearly 1.6 million views not even halfway into the season. More than 500 video clips are arranged through member recommendations — favorites, most viewed, most discussed. The NBA doesn’t have its own TV network like the NFL, but it does offer special game packages to satellite providers DirecTV and the DISH Network as well as digital cable companies. The League Pass are games not available through the league’s network affiliations with ABC, TNT, ESPN, and regional sports channels. 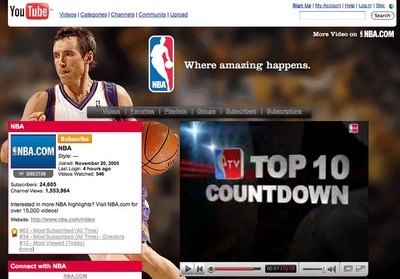 Like the other sports leagues, the NBA.com offers a plethora of highlights, recaps, top plays, nightly notables, and original programming through its NBA TV broadband “channel” found at the Web site. One unique aspect of NBA TV is that fans can mix their own highlight videos, just like producers do for local nightly sportscasts. Taking the Internet one step further, the NBA offers free streaming of live games through two of its network partners, TNT and ESPN. The NFL, for instance, makes streaming available but only through the Super Fan package. MLB offers streaming through MLB.TV subscriptions. Like the NBA, the NHL also has a YouTube channel, with nearly 21,000 subscribers and 1.4 million channel views less than halfway into the season. The quality of the NHL’s channel — as with the NBA’s channel — is typical YouTube: lower resolution for faster load times. It’s a great way to pick through the highlights of last night’s games. 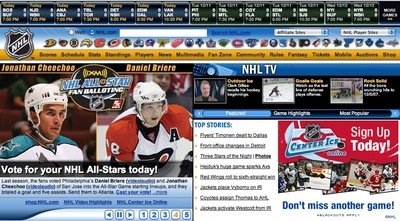 The NHL streams games to Comcast digital Internet subscribers and will let Slingbox users share video clips online. Like the NBA, the NHL offers additional games though NHL Center Ice to the satellite companies and other digital cable providers. The NHL’s video portal is NHL TV / NHL Center Ice Online, accessible through the league’s Web site, which is much more overcrowded and difficult to navigate than the NFL’s, NBA’s, and MLB’s sites. As with the other leagues, fans can find clips, interviews, highlights, analysis, and historical footage at NHL TV. As you might expect, the NCAA isn’t as polished or as thorough as the professional leagues when it comes to Internet and new media strategies. 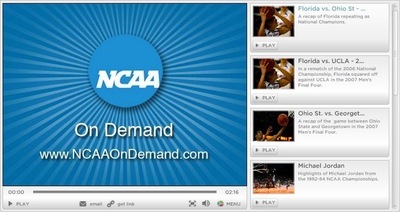 At NCAAsports.com, fans can find highlights of major and minor sports through NCAA on Demand, which also offers DVDs for purchase. Oddly, there are no digital downloads. Much of the NCAA is still devoted to traditional networks such as CBS Sports and ESPN, which pay the organization millions for the rights to broadcast March Madness, the annual basketball tournament. Various national and regional networks also pay for the rights to broadcast conference games such as the Southeastern Conference, the Atlantic Coast Conference, or Big 12. The one thing newspapers have over television is that you can take the paper with you to read about sports, even to the loo. The sports leagues are addressing mobility by offering a wide range of mobile services, although these are no where as mature as what’s available on Web sites. Major League Baseball has the most comprehensive mobile offerings, which includes subscription-based GameDay Mobile and GameDay Plus Audio. These are available through Allel, AT&T, Sprint, and Verizon. The NFL’s mobile presence is strong, but only through Sprint. One way or another, all the leagues send out real-time alerts and text messages, have a mobile Internet location (usually wap.nba.com, for example), and fans can download wallpapers and ringtones and, in some instances, keep up with Fantasy League players and play mobile games. Are European carriers playing hardball with Apple? Hulu to debut this month. Is it already too late? SlingBox: television networks' friend or foe? This is a neat idea. I have a similar concept for watching movie trailers intelligently pulled from Youtube. 1. The NFL network is also available on DISH Network and several smaller Cable networks, i.e. those not named Comcast or Turner Cable. 2. The NBA does have its own channel. NBATV is available on Dish Network and DirectTV. Not sure if it is available on all cable companies. Interestingly enough, NBATV was broadcasting regular season and playoff games before the NFL network started doing the same. Otherwise, the breakdown is dead-on. The MLB games that are downloadable are of extremely good quality. Following up on the previous comment, the NBA TV network is available on most cable systems on their digital sports tiers. Though due to the anemic subscriber totals of most digital sports tiers, they would like to move onto digital basic. MLB will be launching its own cable network on digital basic and on DirecTV in 2009. THE NHL has its own cable channel in Canada and will soon be launching it in he United States. Thanks for the clarity. I’ve edited the post with ref to NFL. this article is useless and inaccurate (see prev. comments). thanks for making a list of the official sites of all the major sports. I may never have thought to type NFL.com into my browser to find NFL related video. I’m pretty sure everyone knows how to watch sports online for money, thanks for wasting my time. The post is designed to give an overview of each sport’s Internet offerings, including but not limited to their official homepages. We hope the table of each offering was of some use. i love NFL, wow thanks for sharing the links which is really worthy to me… Great post, author. Thanks for the comments. Yes, typing NFL.com into a browser is obvious. It’s where one starts. But what struck me was how each league was using the Internet and new media. The Web offerings were not just video highlight clips but branded content around anything the league wanted to show, really — interviews, types of highlights, fan recommendations, and so on. And for that reason, the post evolved from there. At this point, it became apparent that each league is so immersed in the Internet and new media that they are supplanting traditional media as the first-stop information source, at least at the league level. For sports highlights, the internet just can’t be beat. But sports coverage is not just about the highlights, but about live coverage of the games…and that has a long way to go. It’s still too expensive for the average Joe to watch his favorite team live. The day we have live streaming games free to the fans is the day the internet beats television for sports coverage. It’s still up to the fans to decide how and where they consume their sports entertainment. Im surprised that ESPN.com’s video section wasn’t mentioned. It’s particularly intriguing because they are the only sports video portal that allows embedding of videos into other sites. NFL.com, NBA.com, NHL.com, and MLB.com don’t allow embedding, but if/once they do, sports media will be primed for a big boom. It’s refreshing to see ReadWriteWeb and last100.com cover sports media as well. Thank you for that. I like the article. I’ve never seen each sport broken down individually like this. The value of perpetuating a brand through new mediums is necessary if they want to keep a fanbase (market). By competing with their own products might make some people upset, if they paid large sums of money to also have the airing rights. My name is Michael Goldstein, and I have been working on the same concepts of getting the brand name noticed, by offering content. I am So Pist I can Not. Watch any of MY HOCKEY Games IAm talking about MY Philadelphia Flyers have been A Fan since 1974/75 season !!!! Its great…way….Online games have been interest of today’s era, more specifically with online Sports Betting. Yes, even casinos, which usually involve tables, machines, and other complicated operations. Casinos, which are usually administered by many people, can now be played online. Such websites are sports handicapping and Free Picks like sports picks web sites, with free NFL Picks and Free Football Picks, MLB baseball picks NBA and college basketball picks, as well as guaranteed picks from Las Vegas' finest handicappers. There is some software created for that kind of game. Merely wanna input on few general things, The website layout is perfect, the subject matter is real fantastic :D.
When someone writes an post he/she keeps the plan of a user in his/her brain that how a user can know it.